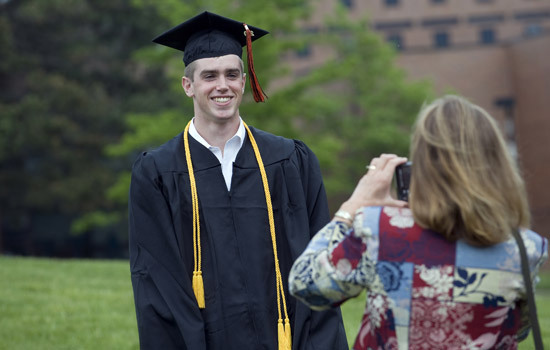 More than 3,500 RIT graduates will enjoy their moment in the spotlight this weekend. As they ready to cross the stage, more than 3,500 Rochester Institute of Technology students prepare to cross over to an exciting new phase in life’s journey. RIT celebrates its new crop of graduates with the university’s 126th commencement. The two-day observance kicks off during Academic Convocation, which begins at 3 p.m. May 20 in RIT’s Gordon Field House and Activities Center. During the ceremony, RIT President Bill Destler confers degrees on both undergraduate and graduate candidates. Brian Hinman, recognized in 2005 as “Entrepreneur of the Year” by Ernst & Young, serves as the event’s keynote speaker. Hinman started his first company at the age of 22 as co-founder of PictureTel Corp. He is now venture partner at Oak Investment Partners, executive chairman of GreenVolts Inc. and executive chairman of Aurora Algae Inc. Hinman will be awarded an honorary doctorate of science. Other highlights of Academic Convocation include recognition of students graduating with honors and faculty members who won outstanding teaching awards. Individual college ceremonies, where each graduate is presented his or her diploma, follow Friday’s Academic Convocation and continue through May 21. • RIT’s Golisano Institute for Sustainability recognizes its first graduates. Annick Anctil earns a Ph.D. in sustainability and Rosa Mitsumasu Heredia graduates with a master’s degree in sustainable systems. • David Johnson, 75, who lives in Canandaigua, receives his master’s degree in imaging science more than 20 years after completing his degree requirements. Johnson missed his original commencement ceremony in 1989 so he could watch his son graduate from the State University of New York at Geneseo. For a complete schedule of activities, go to the RIT Commencement website. NOTE: Journalists are welcome to cover any aspect of RIT’s commencement activities. No credentials are necessary. For assistance, contact Paul Stella at 585-475-4950 or 585-330-6098.